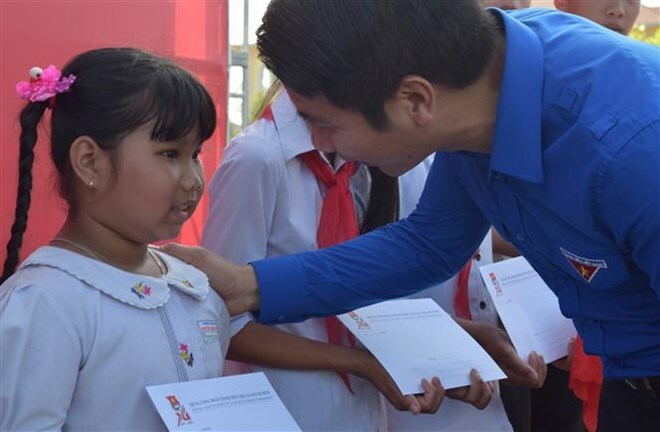 Dong Thap (VNA) – “Thang Ba bien gioi” (The border in March) – a programme to support needy local residents in border areas – was held in Hong Ngu district of the Mekong Delta province of Dong Thap on March 31. The organizers presented gifts to 100 primary students from poor families, families of wounded soldiers and martyrs, along with 20 scholarships to needy students of ethnic minority groups. More than 500 locals in Thuong Thoi Tien town and Thuong Thoi Hau A also received free health check-ups and medicines. Within the programme’s framework, the organizers also built one swimming pool and four entertainment facilities for local children. A monument commemorating border guards who laid down their lives during the Southwest border war was built at Cau Muong border post in Thuong Thoi Hau B of Hong Ngu district. Nguyen Ngoc Luong, Secretary of the Ho Chi Minh Communist Youth Union’s Central Committee, said that this year, the annual programme, which was first held in 2013, will take place in Dong Thap and the northern province of Ha Giang. Along with visiting border guards, the programme also organizes a number of culture-art and sport exchange activities between children, youngsters and border guards, and calling on youngsters to engage in building public works to contribute to the implementation of socio-economic tasks in each locality.